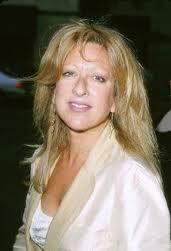 Elayne Boosler is an American comedian. After a brief unsuccessful stint at the University of South Florida, Boosler worked as doorman at The Improvisation comedy club in New York for three years, and it was there that she met comedian Andy Kaufman, a regular at the club, who convinced her she should do standup comedy. The two dated for three years and remained friends until Kaufman's death. Boosler credits Kaufman for her "comedy education" as well as her other peers at the time which included Freddie Prinze, Jay Leno, Larry David, Richard Lewis, Richard Belzer, Jimmie Walker and Ed Bluestone. Boosler was an instant success in a field which was then still dominated by male performers. In 1986 Boosler became the first female to get her own comedy special on cable when Showtime aired "Party of One." Boosler had to save her money and produce the special herself, because none of the cable networks thought people would tune in to see a female do an hour of comedy. People magazine gave it an �A�. John J. O'Connor in the New York Times wrote, "how refreshing, a woman who doesn�t have to tear her own skin off for our amusement. . an attractive human being simply standing there being funny, the first to feel she doesn�t have to be a grotesque." In 1988 in an appearance on CNN's "Crossfire)" program, near the end of the show she called Mother Teresa a hypocrite for not bringing birth control to Calcutta. Hosts Michael Kinsley and Robert Novak both gasped and were visibly shaken. The show quickly cut to a commercial. After that remark her career went into a decline.